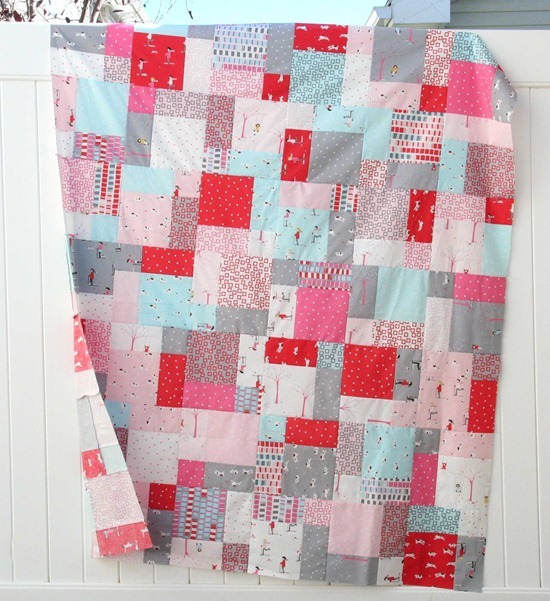 Love this line…..love this layer cake….love this quilt top. It almost makes me want to get pregnant again so I could have a girl to give it to, but then I know I’d have another boy because I know I’m going to have 6 boys. Its true. Anyways….I love this quilt top. Eeeee adorable!!! I'm just finishing mine up today. A layer cake wasn't enough, I need more of this line now!! Very cute! I love the gray! Is that a disappearing 9 patch block? LOL I have 2 boys too. And when people used to ask if I'd try for a girl, I knew if I did I'd end up with another boy too! Luckily my SIL has 4 girls (yep, they tried for a boy… didn't get one either :-P) Love the quilt! Perfect quilt for showing off this fabric! I love it! Wow, I am going to have to buy up lots of this collection. LOVE it! That collection is so great! I think I actually "favorited" the designer on Etsy a while back. Definitely going to stock pile that one! us Mamas of boys have to stick together ;] I so know my 3rd is going to be a boy, as well. I just have to decide if I'm cut out to have THREE boys. It kind of terrifies me! That's a beautiful line of fabric, and I love the way the simplicity of your split 9's works to feature the prints! I can't wait for this one to come out…. This is so pretty, really seems that all the fabrics and colors seem to meld together! Did you do a disappearing 9 patch block with your 10" squares? or did you cut them down? What a perfect pattern to use Serbet Pips for! Allison, absolutely gorgeous. You have done the fabric justice. I can't WAIT to get my hands on this : D !!! I absolutely love this fabric!! I can't wait for it to come out even though in March I will have my second boy. I also am positive that I am destined to be a mother to only boys, so I will just have to make a quilt for myself from Sherpet Pips! Love your quilt! Ooh, that would be good if you could find out when the pre cuts will be available. That line is indeed gorgeous and so is your quilt! gorgeous! I love what you did with these precious fabrics. Can't wait to get my hands on this collection, so I would love to hear if it's available sooner than April (thanks for the tip)! Oh I love this! Something different than what's out there right now. Can't wait to get my hands on it! Super cute! April seems so far away. 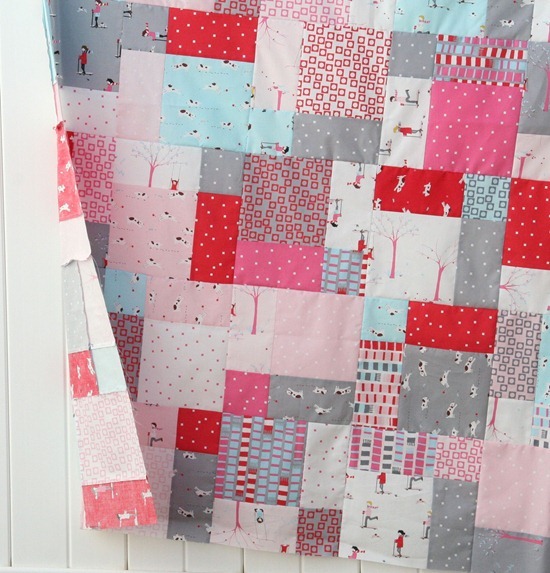 That really is a cute fabric line… Love it! Very whimsical! I love the fabric and its on my holiday list! Beautiful. I just love that fabric. I love your quilt. The fabric is yummy. Is the block a disappearing 9 patch? It is so pretty. I have been coveting these fabrics ever since Amanda Jean emailed me the link to her site. You make me laugh — I have 5 boys — 4 @ the end. I have girl, boy, girl, and then 4 boys. We kept thinking we'd get another girl, but no such luck. I'd definitely be afraid to try again. I'll just make a quilt for me out of that line! The link to Aneela's site is what I meant. Oops. This is so beautiful! I cannot wait until the Spring when these fabulous fabrics are available! Oh my word … SO PRETY!!! Trades like yours, and like mine are SO priceless! Love it! You all, who are the creaters of beautiful home items should read my blog! I hope that you would be inspired! See, I think you could use some of the "non-pink" fabrics and some of the blenders and come up with a boy quilt. The grey dogs? Totally boy! Can't wait to get some. Oh, this is precious! I love the fabrics, too! And, darn it all……I'm having a boy in February. They really do need more boy pre-cuts out there….really! Hey, 6 boys make an awesome family! Mine are all tops in their fields and are super cool! 6 college grads make for interesting conversations when we get together. I never could stand pink so very glad none were female. Quilt top is cute, but give me orange! I have two daughters so when I design boy fabrics they end up quite girly!! Wish I had a little man to inspire me more.